Sattajärvi is a place with a long history. In 1929, the 21-year old Yrjö Kero started the tanning operation when a man crossed the river from Finland to offer him his services as a tanner. Yrjö was a man of action with a lot of projects going at the same time. 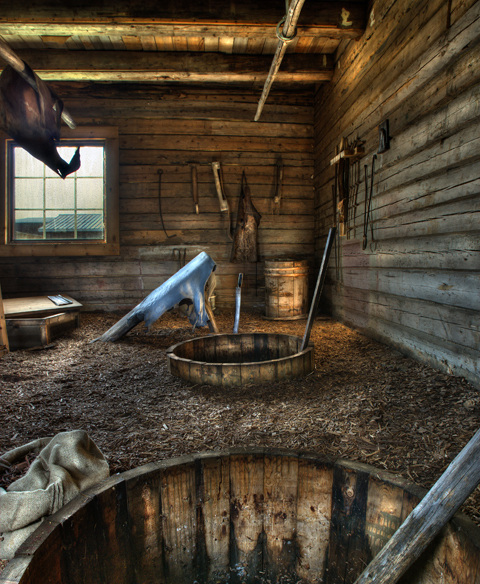 Before tanning started in the old log tannery (bark tannery), bark was collected from spruces and willow in the area. The only machine was a chaffing machine that hacked the bark into small pieces. It took some six months to bark tan a cow hide to ready leather – a manual process from start to finish. “We started on a small scale,” explained Yrjö Kero. “We took in skins for contract tanning from people who came and wanted help to treat their reindeer and cow hides. As time went by we also started buying in skins on our own account, tanning for sale.” Some of the leather tanned in the small farm tannery on was used by village shoemakers for making traditional peaked shoes and other everyday shoes for the people of the village. The first employee was Karl Wälivaara, born in 1919 and Yrjö’s brother-in-law. Employed in the tannery in 1933, Karl was to play a significant role in the company’s success.